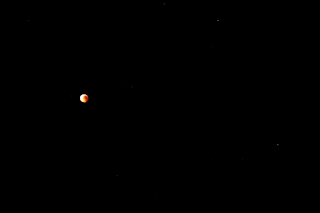 Last night we watched the lunar eclipse. Below is a detail of the event as it happened. John and I are sitting in the yard as I type this post tonight. We here in Hawaii have a front-row seat for a total lunar eclipse that will run about an hour and a half, beginning just before midnight and ending at about 1:22 AM on Tuesday. We came outside at 10:51 PM and it is now about 11:21 PM with the moon about half covered by the earth's shadow. 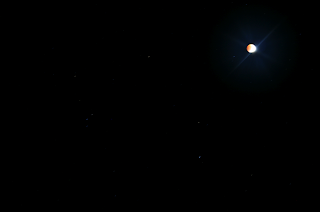 It is said that as the moon passes into the Earth’s umbral shadow, it will take on a reddish-copper color.. 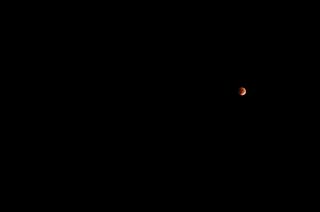 The move into the umbra began at 10:51 p.m. with the full eclipse at 11:52 p.m. As the moon moves into the full shadow, or umbra, an increasingly larger section of the moon will darken to the reddish tinge. I hope to capture all this on film as I am taking photo's about every 5 minutes. Through the binoculars the shadow and moon look like velvet and the umbral shadow is coming into view on the top left corner. 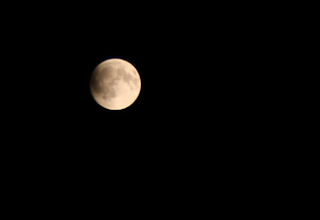 Clouds are now beginning to cover the moon. Wow... where did they come from? There is no wind to speak of tonight. Guess my attentions were focused on the eclipse and not the cloud cover creeping in. So now I sit and wait... fingers crossed the clouds will move out as quickly as they came in. It's now 11:32 PM and 30 minutes ago I could almost read a book out here by the moon light and now I can barely see my hand. The smell of jasmine and kahili ginger is in the air with the sound of crickets and waves crashing against the rocky shores of Waipio Bay just behind the house. Oh... it's back... and the umbral shadow is very prominent. Another cloud just rolled in which caused a million stars to suddenly come into view including a bright blue shooting star. At 11:54 PM, 2 minutes past the peak effect, a very large cloud covered the moon and it has been missing now for 15 minutes. In the distance I can see a trail of head and tail lights from cars making their way back down from the summit of Haleakala. What it must have looked like from up there at 10,023 feet! So I guess it's time to head in and begin uploading... oh wait .. it's back. 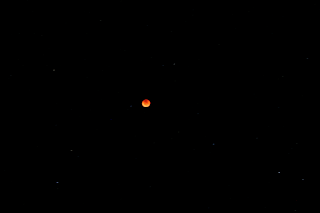 and very, very red. Not much has happened since around 12:30...so I am going in to upload images. Besides, my neck is killing me. I'll check it out again closer to 1:00 AM. Ok I'm cooked. It's 1:22 on the nose and it's supposed to be over. 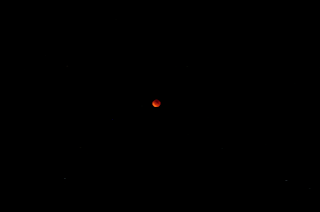 The moon is still half red and white... only now the red is on the right. *Make sure to click each one to see the large version. I smell the fragrant flowers, heard the crickets and waves - and when you described that blue shooting star, I swear I saw it, I did! Wish I were there - I would'a stayed awake with y'all instead of retiring to sleepbyeland like I was here at home.